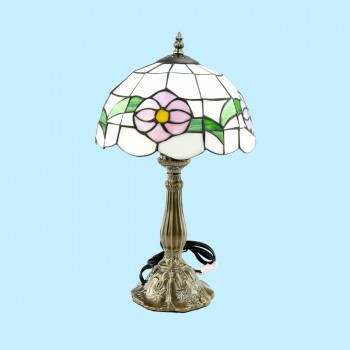 Antique Brass Tiffany Style Stained Glass Table Desk Lamp. This antique brass floral base is apply named Le Bouquet and measures 18 3/4 inches high. Solid Brass base with felted bottom and an antique finish. On/Off switch, takes a 60 watt, B style bulb, not included. Measures 18 3/4 in. H x 10 in. dia. shade x 5 3/4 in. base.